Last week both Cunard Line and P&O Cruises announced that they would be offering three world or extended cruises in 2014. Cunard’s cruises involve all three of its Queens, Queen Mary 2, Queen Elizabeth and Queen Victoria, while P&O Cruises’ voyages will be offered by three of the line’s “A” team – Arcadia, Aurora and Adonia. 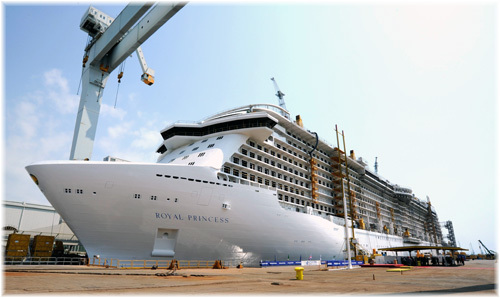 Meanwhile, at Monfalcone last week, Princess Cruises floated out its newest ship, the third Royal Princess. And finally, The Cruise Examiner is today on board a 10-passenger French container ship, en route from Southampton to Rotterdam and Hamburg, and will report next week on the revived popularity of cargo ship cruising. 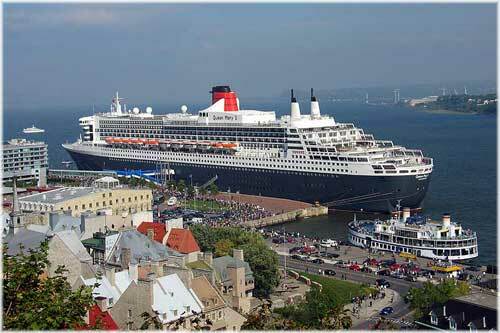 Cunard Line will once agin offer three world cruises in 2014, one by each of the Queens, while P&O Cruises will offer two world cruises and an extended Asia voyage, using three of their “A” team. Cunard’s flagship, Queen Mary 2, will set out on her 119-night World Cruise in her tenth anniversary year. Following the success of her inaugural circumnavigation of Australia in 2012, QM2 will undertake a repeat performance in 2014, with calls at eight different Australian destinations during a 33-day circumnavigation. Fremantle, Sydney, Melbourne and Brisbane will all feature twice, making it possible to circle the continent from and back to any of these ports of call. The voyage will also feature overnight calls in Dubai, Hong Kong and Cape Town. Queen Elizabeth’s 118-night World Cruise will feature forty ports in twenty-three countries with overnight calls in San Francisco, Sydney, Hong Kong, Singapore and Dubai. This sailing will see her debut in Japanese waters, with maiden calls at Kochi, Yokohama, Kobe and Nagasaki, as well as Pusan, Shanghai Xiamen, Abu Dhabi and Aqaba for Petra. The Queen Victoria’s 116-night cruise takes in thirt-three ports in seventeen countries and includes an overnight call in San Francisco and once-in-a-lifetime moments such as rounding Cape Horn and taking in the scenic views of Chile’s Amalia Glacier, Pio X Glacier, Easter Island, Pitcairn and New Zealand’s Milford Sound. 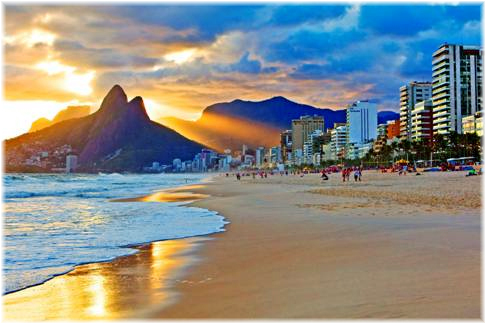 Maiden calls include Fortaleza, Rio de Janeiro, Montevideo, Buenos Aires, Puerto Madryn, Ushuaia, Punta Arenas, Puerto Montt, Moorea and Suva. With all three Cunard ships cruising the globe it will be possible to create a two-ship voyage incorporating an extended stay on land in Australia. Board any ship for the sailing down to Sydney, followed by a period of nine, 12 or 14-days before the chosen return voyage departs. The homeward voyage can be either with Queen Mary 2 via the Orient, Arabia and the Mediterranean, or Queen Victoria, travelling in the opposite direction, port-hopping along the east coast of New Zealand before crossing the Pacific, transiting the Panama Canal and crossing the Atlantic back to Southampton. P&O Cruises, meanwhile, will also offer three world cruises, collectively visiting eighty-one destinations in forty-one countries. The Arcadia and Aurora will undertake full world cruises while Adonia will offer a port-rich itinerary in Asia. All three ship will sail roundtrip from Southampton. The Arcadia departs Southampton January 10, 2014, sailing out via the Caribbean and west coast USA before sailing to Australasia via French Polynesian islands, then on to Indonesia, India, the Middle East and the Mediterranean. This cruise departs just a month after she returns from a 17-night refurbishment in Germany, with new soft furnishings and carpets in public rooms, bars, cabins and restaurants. In addition, ten new single cabins will be added. The Aurora departs from Southampton January 4, 2014, also sailing west via the Caribbean and San Francisco before sailing to Asia via Honolulu, New Zealand and Australia, then on to India and South Africa. Aurora, a classic world cruise ship, is family friendly. At 109 nights, this ship will spend more time in Asia and Africa. 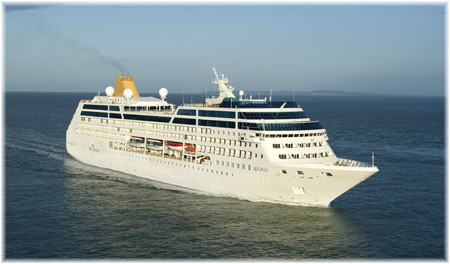 The Adonia Asian cruise departs Southampton January 7, 2014, sailing east via the Mediterranean and Middle East before exploring Asia. 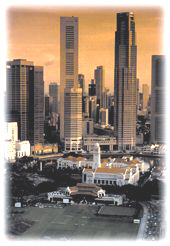 Ports include Petra, Malacca, Manila, Hiroshima, Hong Kong, Sihanoukville, Langkawi and Mumbai. New ports will be Fujairah in the United Arab Emirates, Yangon in Burma, Port Blair in the Andaman and Nicobar Islands, Kuching in Borneo and Puerto Princesa in the Philippines. Extended calls will be made in Port Said, for Cairo and the Pyramids, Dubai and Safaga, for Luxor and Valley of the Kings. 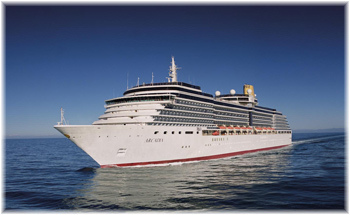 In addition to the three world cruises, there are sixteen voyages to and from Australia and New Zealand on Aurora and Arcadia, wit shorter sectors available.A 37-night Southampton to Auckland cruise on Aurora makes calls in Ponta Delgada, Antigua, and Aruba, transits the Panama Canal, then calls San Juan del Sur in Nicaragua, San Francisco, Honolulu, Pago Pago, Nuku Alofa and Auckland and there are several other laaternatves available. Princess president and ceo Alan Buckelew and Royal Princess Capt Tony Draper attended the float out last Thursday in Monfalcone of Princess Cruises’ new protoype ship, the Royal Princess. Also attending were long-time Princess master Captain Nick Nash and his daughter Victoria, who served as godmother to the new ship. The Cruise Examiner boarded the 10-passenger 5700 TEU French-flag container ship CMA CGM Chopin in Southampton last night and is presently on his way to Rotterdam and Hamburg. Next week he will also report on the growing world of freighter travel.